Not surprised. Everyone loves to $hit on Detroit why should Keith Olbermann, who hasn’t been in the sports world in a decade, be any different. Mike Trout had a great season but Miggie was far more feared a batter. I understand. I truly do. But by making that argument, you are handing over the history of the game to the sabermetricians and statisticians. Bert Blyleven deserved in the HOF, not for his accumulated stats but, for his HOF curveball. Watch it. See it. You just know. With his numbers and that pitch, he was a no-brainer. Similar to Cabrera here. The argument isn’t who had the better stats or added more statistically provable value to their team, it is who was the best player in the league. He won the Triple Crown. The Triple Crown. HOF curveball. Triple Crown. Don’t overthink it. Believe your eyes. Cabrera for MVP. In other words, allow your personal biases and preferences to trump objective data. Cabrera will probably win the MVP. But Trout should win it. Um. Where are Trout’s “down the stretch” stats here? If I recall correctly, they kinda’ sucked. I hardly agree with anything Olbermann says and he is far and away right on this. Do your homework people and the truth shall set you free. Let us not forget that while Trout was hitting much tougher AL West pitchers, Cabrera was feasting on the Royals. Please, it’s not even a contest. There is so much that sways this in Trout’s direction and it’s not to discount what Cabrera has done. He had a great season and my second place vote goes to him, despite that he is a complete butcher at third base while Trout is elite defensively. Keith, you talk about stats like the Triple Crown being outdated, yet you want to evaluate the Tigers based on how they would have finished in pre-division MLB. Rather hypocritical. Base don tha tloic, Trout is even worse because he had a lower average than Cabrera. I will also point out that a game won in April counts as much as a game won in Sept or October. That is the fallacy of your argument. Why don;t you check the same stats for Trout. he had exactly 2 homers in 10 games. He batted 317, but a single game accounted for 4 of the hits when the season was over for the Angels. The games AFTER the Tigers clinched are not that important. I don’t see how the Tigers having a worse record than the Angels and making the playoffs is the Tigers fault. That is an MLB issue. The MLB should get rid of the divisions and the top 6 teams in each league make it to the playoffs. As far as Cabrera, he should win it. 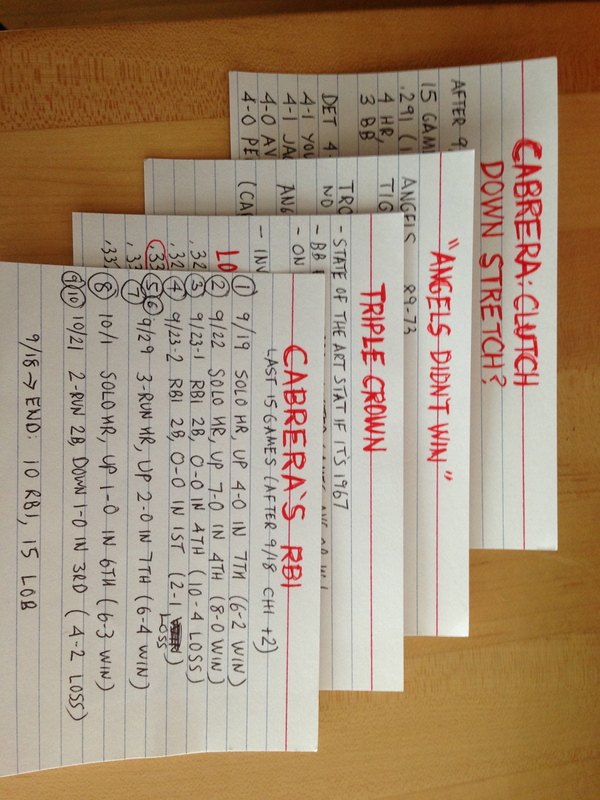 Trout was great but he didn’t put up the numbers Cabrera did, plain and simple. If you give the WAR argument, how come Price won Cy Young over Verlander. Verlander had a higher WAR. I can’t believe there’s even an argument. I’ve waited my whole life to see a Triple Crown winner, wondering if it would ever happen. His team also wins the division while Trout’s team misses the playoffs– if that is taken into consideration. What’s happening is there is so much hype surrounding the awards, with the Internet and with cable channels, that sportswriters are outsmarting themselves. The obvious thing is to vote for Miguel Cabrera. The cutesy, look-at-me-I’m-an-inside-the-numbers-WAR-guy thing to do is vote for Trout. Fortunately the sportswriters showed by voting for Dickey to win the Cy Young that they are still a few years away from being Keith Law clones with smug, know-it-all assertions on ESPN– long live the old guys who saw Frank Robinson and Yaz and Mickey. These gray-haired writers (if they have hair) use their eyes and their brains, not some computer formula, to make judgments. So let Cabrera win the MVP as a last stand for blue collar baseball. I agree whole-heartedly with you… fantasy stats are superseding important historical feats like the Triple Crown…thought we’d never see another. These gray-haired writers (if they have hair) use their eyes and their brains, not some computer formula, to make judgments. Dunce. How do you think a “computer formula” comes into existence? Does the computer create it itself? The high-level statistics have been created by people who ask precise questions about how baseball games are won and lost, and how players do things that win and lose games. Thirty years ago, Bill James didn’t even have a computer. It may gall you to think that Nate Silver knows more about baseball than you do, but he does. No and no. But the mind that creates the computer formula isn’t the same mind that evaluates baseball talent. It’s like asking Tony LaRussa to create a computer. Nice. I seem to see the world a little different after reading Keith’s blogs. I hope to see you on MLB more often. Peace. Keith, thanks for all the love you showed Miggy. We love him here in Michigan. And, as a nurse, I wish you would have been a doctor. I would have been able to read at least somebody’s handwriting! Watching Hot Stove. You have to be apart of some show on MLB. Greatness! The Oracle of Baseball. Cabrera winning is like Obama winning– it reassures me that sanity is still alive. Well, as someone pointed out earlier; Nate (The Great) Silver said the same thing as Keith on his 538 blog yesterday morning. Baseball has always been about “Stats”, period. Both players had great years, and as Trout becomes more seasoned, he is just going to get better and better; not unlike NL MVP Buster Posey. GO GIANTS!!! No, 7th out of 14 is the bottom position in the First Division. Claiming to be a stat nerd and getting something as simple as that wrong is a sign of shame. Yep, I was also going to point that out…pretty sloppy on KO’s part. He knows baseball/sports, but someone liked me here, and I didn’t find this very compelling. KO, (if you or a moderator screen this I just needed a way to reach you- don’t have to add to your blog if you don’t want to). First of all this whole “best” player vs “most VALUable”… the winner should only be the player who demonstrated the highest production VALUE of all players in that league. If not then MLB should take the VALUE out of VALUABLE and replace it with… well … anything else! No argument Trout was the most VALUE centered productive player in ALL of MLB this past season. Problem is traditionalist aren’t big on projections and or multi-level math formulas to prove production. As an every day fan…we/they just want some straight forward, easy to decipher, hard to argue production values. If you want to know about an exclusive yet tested system for evaluating player production that does not include the tangled webs of sabermetrics that scare away the every day common baseball fan and — a system that is not traditional stat centered but which — supports Trout as hands down the more productive offensive player –then give me a holler. If I don’t hear back from you then there are others who show an equal or greater affinity to baseball production values and who desire a more adamant argument in getting these awards right! BTW, you can provide me any player you wish and I can provide you their accurate production value in a few quick steps. You can then compare my findings to those of any saberist to verify my systems accuracy of– Keep It Simple Sabermetrics (KISS) and or Statistics for the last “S” to cover the traditional statistical systems. Fact is, you can quickly compare Trout’s (any player) history making season to ANY current or former players best season from ANY era where MLB stats are available. Because it is based on pure production (exactly what a player did in the game) my system works the same in showing productivity: Per Game, AB, PA, Series, Season or Career no matter who, what, where or when they played. Though my proven system more times than not agrees with saberist it does so with “simplicity minus intricacy”–no need for some computerized shredder or simulator. If I have the info I need available, I can come up with a “hard to argue” players offensive production value in a matter of minutes. My proprietary system is not based on predictions or projections (though these can be made from the production values assessed). Nor does it draw conclusions about a player based on what others in same positions “could/would” do and there is def no UZR (though my system accounts for this similarly on defense). Productivity is derived purely from what a player does between the lines, per game objectives and in opportunities they are presented with to produce / perform on the field. A system based solely on what are eyes see not what our minds or worse –some computer generated mind projects! This system may well be the neutralizer for both saberist and traditionalist alike. Hope to hear back from you to discuss this proprietary system with you further. P.S. my apologies if this made it to the blog and is too lengthy. OK KO…the talk on the streets (TV screens) is “it is time for something new” to make the player production facts stand out OR at least…we can agree something different. The two camps of saberist & traditionalist are still not even in the same ballpark as evidenced by the 22-6 voting so perhaps timing is everything. Though I am sure Trout advocates would have preferred a better “seal the deal” system for offensive productivity before now. Saberist need a closer and traditionalist need a reliever. I put the ball is in your Blog…call out to the bullpen (me) and see if my stuff can’t close the gap on player production or at least –get the two camps on the same playing field. And if I’m way off base…then you will pick me off and I’m out…. but –what if I have the game winning run or magical strike 3 pitch? The value of which could be both intrinsic to the game as well as extrinsic to the players, media and all involved in the game at every level. Saberist went through the same “what if?” litmus test I am confronting now and look how far they have come! I am offering you a chance to test my system and compare my production results to both camps and so far …one swing and a miss? KO, I gotta hand it to you. I hate everything about your politics, BUT, I love everything you write and say about sports. I always thought you were the best part of the Dan Patrick show. Great article, and keep it up. Motorcycle jacket is cool, it is the most popular hot leather clothing style, OL weekday shaping able shape cannot be one of the missing items, easy mix of performance motorcycle jacket become more hot, mysterious black color noble, handsome able and very neutral! Black motorcycle jacket very handsome can show a woman, very wild and very personal, some new breath of autumn mix of suihua dress. I would simply like to know Cabrera’s average with RISP. Just because he was less hot in September does not diminish his contributions throughout the season. By virtue of his MLB leading runs scored–no player epitomized a Runner In Scoring Position (RISP) better than Trout. The fact he placed himself in a position to score give or take 49 additional times (SB) and 45 more times than Miggy –also stands out. Add these 45-49 to Trout’s Total Bases (TB) and see how little THAT gap becomes as well. Ditto for XBH where both stats do not always equate to RUNS scored (main objective of the offensive game). And while your making a case for Miggy’s BA with RISP you should also factor in his league leading 28 times he hit into DP’s and how many prospective RISP that took away compared to Trout’s 5. Pat Miggy on the back for his RBI’s and BA with RISP but recognize he accumulates these stats BECAUSE of the RISP type of player…for which Trout was the poster boy in all of MLB in 2012. Add that Miggy’s place in the batting order gave him ample more opportunities to move the Mike Trout’s of the game on base ahead of him whereas Trout started every game with at least 1 AB with no RISP….and he still did what the offensive game called for –produced more runs than anyone else in the game with FEWER game chances to do it in! It is easier to accept Miggy won because of the TC not because of how well he hit with RISP. But, if you are going to use a RISP argument to boost the Miggy MVP confirmation just remember which player best defined a RISP in MLB for 2012. News Corp is buying a 49% stake in the YES Network– so I bought another Mets cap. Rupert Murdoch/Yankees = I watch the Mets. So, RobertaK, what about the voting guideline to consider number of games played, where Cabrera had the distinct edge? Or the one about taking into account such factors as character, loyalty, etc., which clearly calls for inclusion of intangible factors? Way to cherry-pick your argument. I know that this is a little late, but I just have to have my say somewhere. I understand your argument in favor if Mr. Trout and I understand the people that want Mr. Cabrera. I also say a pox on both camps. I have never seen such cherry picking of stats in support of positions. Mr. Kenny claims to want to use only stats that “isolate” individual performance. With the exception of “true” outcomes there are no stats that isolate individual performance. An argument can be made that Mr. Trout’s performance was inflated because he was new and TEAMS did not know how to best approach getting him out. Equally, it can be argued, Mr. Cabrera’s stats were deflated because he is well known and TEAMS did know how to best approach to getting him out. I’m not saying that that was the way it was, I’m just saying that virtually none of the stats, the exceptions being Walks, Strikeouts and Home Runs, are really individual. If I was building a team from scratch, I’d take Mr. Trout (actually I’d take Mr. Harper as I think he has more upside) because with his youth, you’d have a chance that he would still be relevant when the team started to challenge for titles. If I had an established team and needed a player to put me over the top, I’d take Mr. Cabrera. His proven long term performance trumps Mr. Trout’s single season. So, which do I think was the MVP for 2012? Mr. Cabrera because I would pay him more in a one year deal then I would pay Mr. Trout. No way that a rookie, that started the season in AAA faces the same season as a seasoned veteran like Cabrera. Not only does Cabrera have every pitcher he faced all season long trying to pitch around him, but he was moved to 3B defensively to make room for Fielder at 1B which is a big adjustment. Trout plays well in CF,but it’s not the hot corner. Give Trout a couple more seasons to prove that he belongs in these lofty conversations. LAA didn’t do that much until Puljos showed up late in the season. Let’s see what Trout does in his first full season and without Tory Hunter in LA to hold his hand. And Darvish beats out Trout for the ROY imo!! Keith, why take your two week example and open it up a bit further and see what you find? Don’t waste your time, I’ll just tell you. Trout was very pedestrian over the last two months of the season while Cabby was not, but hey it’s baseball and statistics and they can be sliced and diced any way to make a person look right. This debate has simmered down since last month and with all the trolls and troll police inundating anything KO does I have waited until now to weigh in. I respectfully disagree with KO. While the numbers he brings forward are sound, it is the intangibles, the things folks like Brian Kenny and his sabremetric savants say don’t exist, that swing the balance towards Miggy. It is true that Fielder and Jackson were also big parts of the September run but Miggy fueled it with his Triple Crown chase. There are times in baseball that the accomplishments of one player are key to the fate of the team. That is where Cabrera’s value is. It isn’t measurable but it is there, just like R.A. Dickey has value to the Mets far beyond what he does on the field or in the clubhouse. Mike Trout had a wonderful season and is a worthy RotY. However, when it comes to the overall impact a player had on his team’s performance, then Miguel Cabrera is, in my view the AL MVP. I look forward to Trout picking up a few MVPs as his career goes forward, especially since the Angels added Josh Hamilton to the line-up. Luckily liberal logic did not infect those voting for the MVP to any large degree. KO, you need to compare and contrast, not just slam one side. But, that’s your MO, right? Pitch around Miguel and attack the rest cannot hit RISP. Tigers are all about Zoolander, Scherzer, and Miggy. Rest are flawed players. Bullpen will blow it up like always in the last 8 years. Have to attack like Bonds’ giants. That way the Tigers can have no more than 2 runs. MVP’s are McCutchen and Yadier Molina.